“Remember Bataan, Fight for Justice!” The Justice for Filipino American Veterans (JFAV) Los Angeles Steering Committee and the Association of Widows,Advocates and Relatives for Equality( AWARE) cordially invites you to join our commemoration of the 68th anniversary of Bataan Day,April 9, 1942. On Saturday, April 10, 2010 from 9:00 am to 1:00 pm, JFAV and AWARE will be honoring our local Filipino American World War II veterans, especially those who survived the Bataan Death March, at the Filipino American Community of Los Angeles (FACLA) 1740 W Temple St, Historic Filipinotown, Los Angeles, CA 90026. The Justice for Filipino American Veterans (JFAV) Los Angeles Steering Committee and the Association of Widows,Advocates and Relatives for Equality( AWARE) cordially invites you to join our commemoration of the 68th anniversary of Bataan Day,April 9, 1942. 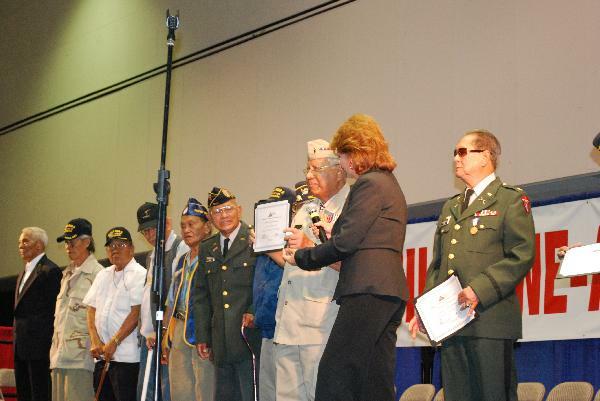 On Saturday, April 10, 2010 from 9:00 am to 1:00 pm, JFAV and AWARE will be honoring our local Filipino American World War II veterans, especially those who survived the Bataan Death March, at the Filipino American Community of Los Angeles (FACLA) 1740 W Temple St, Historic Filipinotown, Los Angeles, CA 90026. JFAV and AWARE will be presenting the veterans and widows with recognition certificates on April 10th. This is the spirit of further forging the connection between the younger and elder generations. Concurrently, this year's Bataan Day commemoration will also herald the launch of the grassroots campaign to support the lawsuit that JFAV and Atty. Arnedo Valera, Esq. of the Migrant Heritage Commission based in Washington DC will soon bring against the US Department of Veterans Affairs (DVA). JFAV and our community's efforts have recently guaranteed Filipino American veterans a one-time lump sum payment through the American Reinvestment and Recovery Act, this is a far cry from full recognition and several months have passed with thousands of veterans who have yet to receive a single penny of their promised compensation. JFAV demands an explanation from the DVA as to why this inequity continues and the veterans need your support now more than ever.